Tumors in the temporomandibular joint (TMJ) area are relatively infrequent, especially intrinsic tumors arising from the joint component, that is, articular bones, capsule, and attached ligaments. Among these, occurrence of pigmented villonodular synovitis (PVNS) is rare., One such case of PVNS at TMJ region with deceptive clinicoradiological findings, diagnosed cytologically, is presented here. A 21-year-old female presented with complaints of swelling over left angle of mandible, increasing slowly in size since 6 months and pain during mastication since past 3 months. There was no history of fever, tuberculosis contact, or any other significant medical history. On examination, swelling was nodular measuring 1.5 × 1.0 cm, firm, nontender, and showed restricted mobility. No other abnormality was detected on general or systemic examination. Contrast-enhanced computed tomography neck showed evidence of a contrast-enhancing soft tissue mass measuring 17 × 15 × 12 mm seen along lateral and anterior aspect of left mandibular neck [Figure 1]a. Bone and joint space appeared unremarkable. Magnetic resonance imaging (MRI) of face with left TMJ showed a lesion along the condylar process of left mandible measuring approximately 19 × 12 mm, compressing the left parotid gland, showing signal intensity similar to the bone [Figure 1]b. Mild synovial thickening was seen. Based on MRI findings, a possibility of pedunculated osteochondroma was suggested. 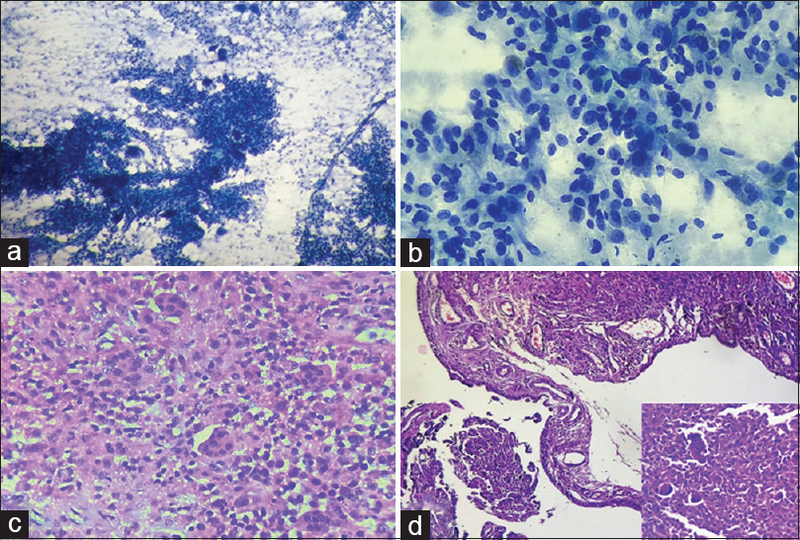 Fine needle aspiration (FNA) was performed; smears were highly cellular and revealed round to oval cells arranged in loose clusters, fragments, and many singly scattered [Figure 2]a. These cells displayed eccentric nucleus, indistinct to prominent nucleoli, finely granular evenly distributed chromatin with moderate amount of pale blue cytoplasm [Figure 2]b. In some of the cells, intracytoplasmic hemosiderin deposits were also observed. Many osteoclast-like multinucleated giant cells, interspersed and adhered to the cellular fragments, were seen. The background showed pigment-laden macrophages, fibrofatty fragments, and hemorrhage. A repeat FNA was done and cell block was prepared. The section examined showed bland-looking mononuclear cells in sheets and fragment with occasional villous-like projections along with many multinucleated giant cells and pigment-laden macrophages [Figure 2]c. Cytological diagnosis given was of a giant-cell-rich lesion, suggestive of PVNS. The lesion was excised. Histological examination confirmed the diagnosis and revealed synovial tissue with neoplasm comprising numerous multinucleated giant cells scattered among mononuclear cells and having similar nuclear and cytoplasmic details [Figure 2]d. Hemosiderin deposition was noted within the stroma and within histiocytic mononuclear cells. Postoperatively, the patient was doing well and was lost to follow-up after 4 months. In FNA cytology of TMJ region, differential diagnoses of parotid gland lesions must be considered including pleomorphic adenoma, inflammatory parotid lesions, and benign and malignant mesenchymal lesions. In the present case, FNA smears did not reveal any evidence of osteoid/chondroid material or glandular elements. Furthermore, considering the presence of multinucleated giant cells, careful assessment for primary parotid gland tumors was done, as it may represent a reactive stromal process to an epithelial (usually high-grade) neoplasm, however; no overt malignant features were noted., Among mesenchymal lesions, fibrous histiocytoma is another differential. FNA of these lesions should yield cohesive tissue fragments composed of epithelioid and spindle cells; larger tissue fragments may show whorling or “storiform” arrangement of the cells. Multinucleated cells may be present in varying numbers, but almost never display the osteoclast-like morphology as seen in the present case. TMJ tumors may not show significant difference in the clinical manifestations and can be certainly misdiagnosed leading to delay in the treatment. Here we have demonstrated one such case in which initial clinical and radiological picture was misleading and FNA findings helped in arriving at the diagnosis. We reiterate the role of FNA as a minimally invasive and cost-effective procedure in diagnosing such challenging and unusual lesions. Wei WB, Chen MJ, Yang C, Qiu Y, Zhou Q. Tumors and pseudotumors at the temporomandibular joint region in pediatric patients. Int J Clin Exp Med 2015;8:21813-7. Damodar D, Chan N, Kokot N. Pigmented villonodular synovitis of the temporomandibular joint: Case report and review of the literature. Head Neck 2015;37:E194-9. Ren R, Mueller S, Kraft AO, Powers CN. Giant cell tumor of temporomandibular joint presenting as a parotid tumor: Challenges in the accurate subclassification of giant cell tumors in an unusual location. Diagn Cytopathol 2018;46:340-4. Yu GH, Staerkel GA, Kershisnik MM, Varma DG. Fine-needle aspiration of pigmented villonodular synovitis of the temporomandibular joint masquerading as a primary parotid gland lesion. Diagn Cytopathol 1997;16:47-50.